This is my first iron cupcake challenge and its awesome coz you get to be all creative! The theme for this month is “Winter Warm Up”…which I have to say was very strange for me, seeing that it’s summer over here in South Africa! And on some days reaches over 38°C (100°F)! On the particular day that I baked for this challenge it was one of those days! So there I was, standing in the kitchen and trying to get some good photos before they all started melting on me. Not to mention that the heat makes you so tired and I nearly fell of the chair while standing on it to get some top shots. Well, enough about my heat induced clumsiness (although I don’t need the heat to be that way)… winter is my favorite season of all, It always reminds me of snuggling up on the couch with a hot steamy mug of hot chocolate… *sigh* why can’t it be winter now!? 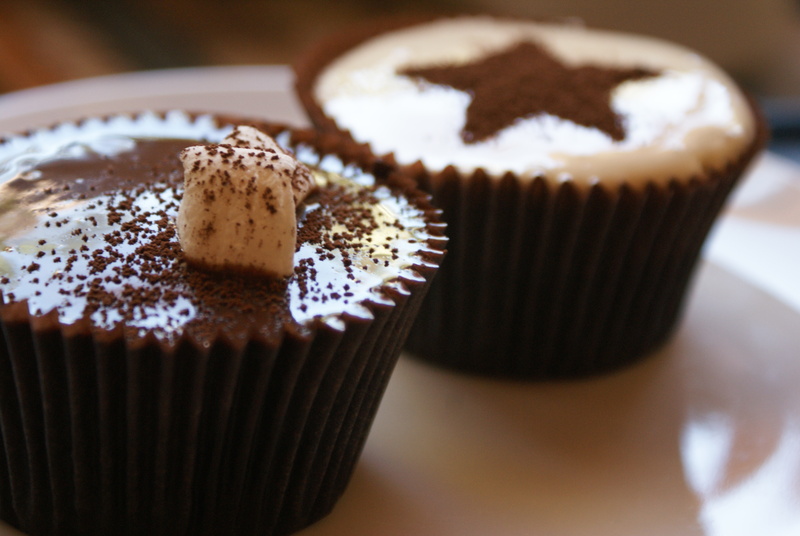 So I decided to make my cupcakes look like little mugs of hot chocolate… hope you like them! Reduce speed to low and add wet ingredients one by one, mixing well to combine. Fill liners 1/2 full (they rise a lot) and bake for 17-20 min. Cool completely before icing. Let cool until its at the right consistancy, then spread onto cupcakes. Cut up marshmallows or use mini marshmallows, and arrange them to look like a mug of hot cocoa, then dust with cocoa powder. Cut out a star from a piece of paper to use as a template. hold the template over the cupcake and dust cocoa powder over to form a star. :) my dignity is still in tact…for the moment! But anything for a good pic! nice to know this recipe…hope will be tasty..